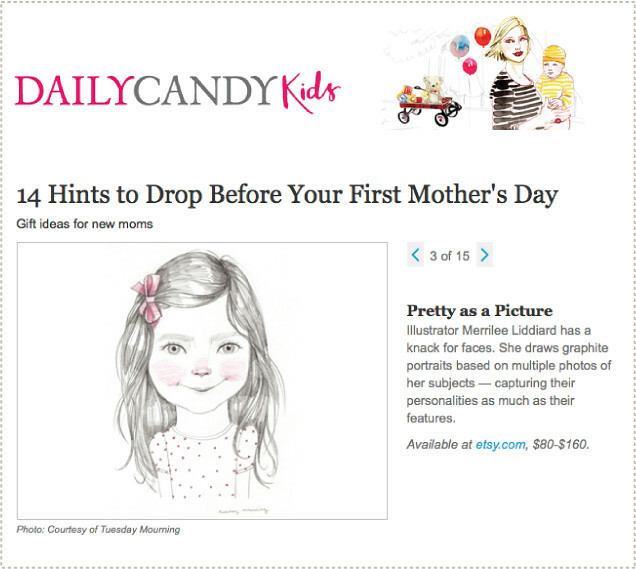 Custom pencil portraits up on Daily Candy Kids today! Hello friends! So we all know it's helpful to drop a few hints before Mother's Day to let our loved ones know what would be extra special for us, right? And Daily Candy Kids is here to help us out! Today they were so kind to mention my individual pencil portraits, found in my shop here, as a great suggestion for Mother's Day. And I couldn't agree more! For more information on how the ordering process takes place hop on over to my illustration blog to read more and see some great before photos and after portraits. And don't delay because slots for Mother's Day portraits will fill up fast, so order yours today! I wasn't kidding when I mentioned that this quilted herringbone comforter was my new go-to baby gift. It seriously is the best. So simple and the pay off is great. I recently made another one for my little sister Lorajean, who just had another baby girl, Evangeline (don't you just love the name!). Only this time instead of going for a quilted herringbone stitch, I simplified and went with a free style chevron quilting pattern. It was SO easy and there was really no way to mess up (I personally love that some of the zigzags are closer together and some are farther apart). Just find some great great fabric for the front and back, sandwich some batting in the middle of the two sheets, baste, and then quilt away! And you'll notice that I used the same binding from Eleanor's quilt (I'm kind of in love with it and, well I had a bunch left over) and went with Heather Bailey's tried and true continuous binding technique. 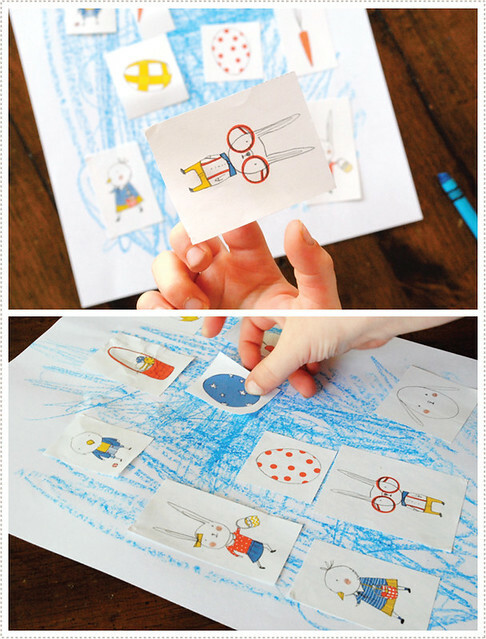 This is also great project for littles ones who are learning to sew and would love to start quilting. You could even do a mini version for a little doll or softie. Wouldn't that just be so cute?! And I promise you, you could do the entire thing in one afternoon (I did! but we won't get into my tendency to procrastinate...). 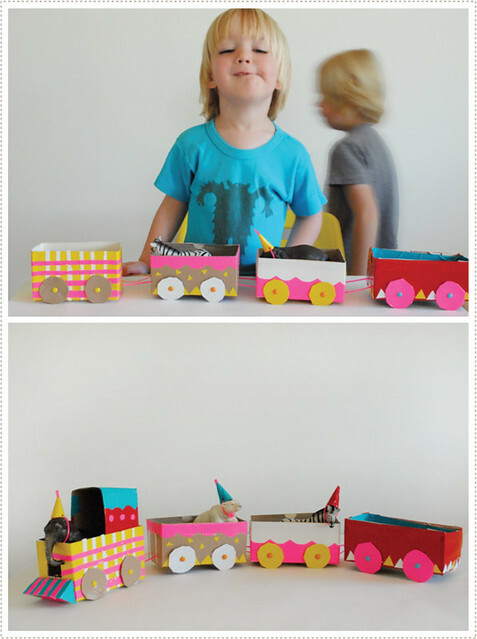 The boys and I had a fun weekend enjoying the most lovely weather outdoors as well as putting together a few impromptu projects, such as this tea box animal circus train. There's something really rewarding about creating something magical out of simple leftover pantry items, like these herbal tea boxes. And on Earth Day weekend, well I couldn't think of a better re-purpose project. Basically we grabbed a few herbal tea boxes from the pantry and threw on some fun colorful duct tape. 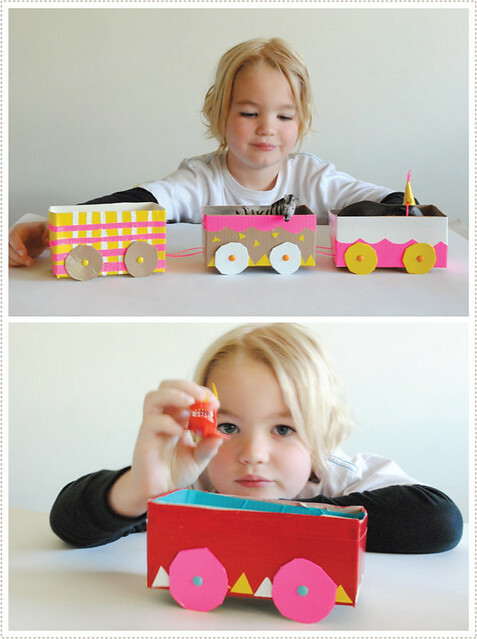 This helped reinforce the strength of the boxes/train cars as well as add pops of color and design. 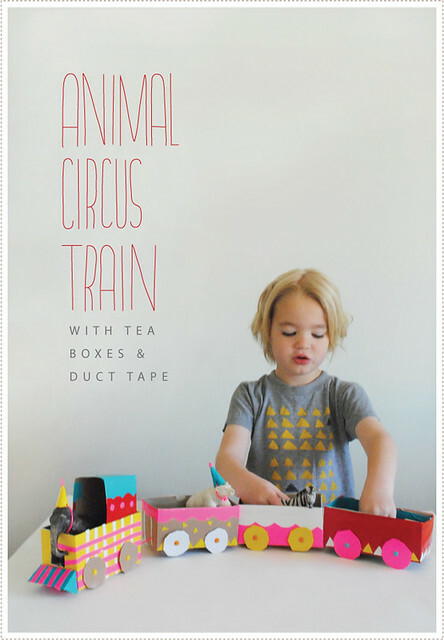 Duct tape is a little difficult to cut (super sticky) so I would suggest doing this alongside your Littles. 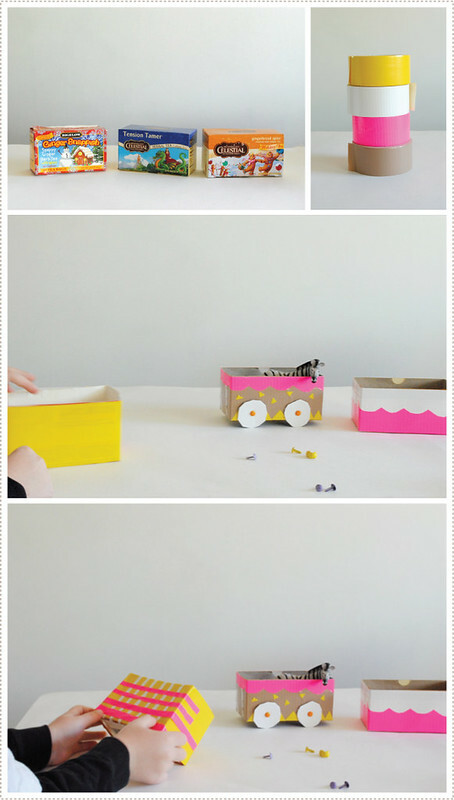 We started with just three fun cars decorated in a simple, bright color scheme. And then A had the brilliant idea of creating an additional car (he didn't feel like it was a true train with only three cars) that could carry his aquatic animals. On his own, he came up with the idea of using blue duct tape to line the inside of the 4th car to suggest water. He then picked the color and design of the car exterior himself. I helped him cut up the tape and he placed it on. For the wheels we cut the tops of the boxes into circles, covered them in tape and secured onto the box cars with colorful brads. We then used neon pink lanyard, and by punching small holes in the ends of cars, attached the cars together. So now we had 4 cars but no engine. And Little O and A would have none of that. Happy Friday friends! 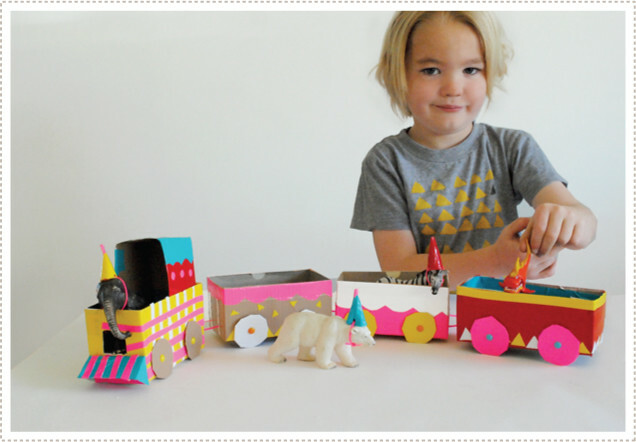 A big thanks to all of you who entered the Hand in Hand: Crafting with Kids Giveaway! 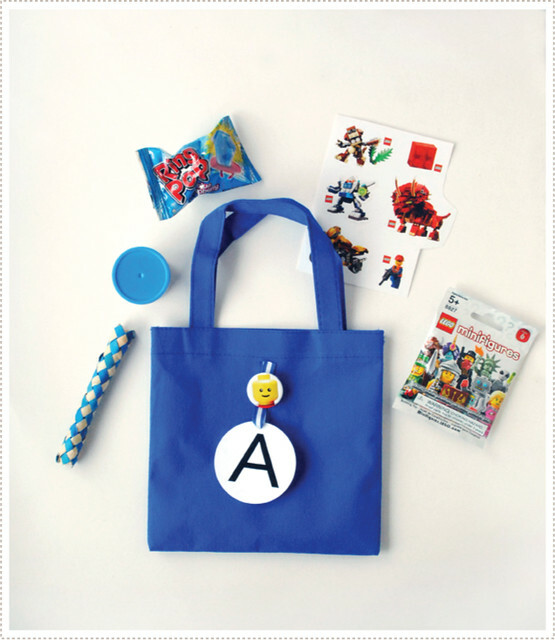 You had some wonderful things to say about crafting and creating with kids. I was inspired! 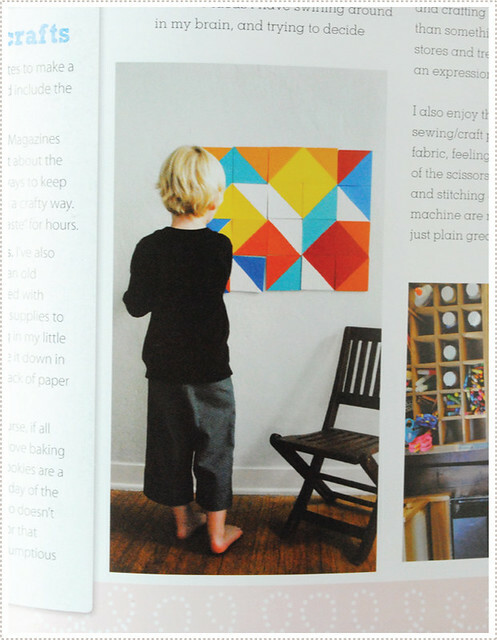 "I would love this book, want to try the geometric tiles!!" Congratulations Hayley! Please contact me at merrileeliddiard [at] hotmail dot com and I'll ship your book off to you! And I couldn't help but share a few inspiring comments from you readers to get us all crafting with our Littles this weekend! "Lately Creed's favorite is when I draw a mystery picture in white crayon and he watercolors over it to find out what it is." "My oldest likes to use his chalkboard easel to tell stories with pictures before bedtime...one of my favorite things." "The best project I did with my students was making button yo-yos...that was by far their favorite, a button on a loop of string. Some of them were still pulling out their backpacks to play with three months later." "My daughter is 22 months old and one of her current favorite creative activities is "painting" on coffee filters. She draws on the filters with washable markers and then "paints" using water and small paintbrushes. After the filters are dried, we cut them into shapes, make flowers, mobiels, etc." And there are so many more in the Hand in Hand Giveaway comment suggestion. Great reading to start your weekend off! And if you didn't win, be sure to pick up your copy of Hand in Hand: Crafting with Kids at your local bookstore or Amazon. You'll love it! 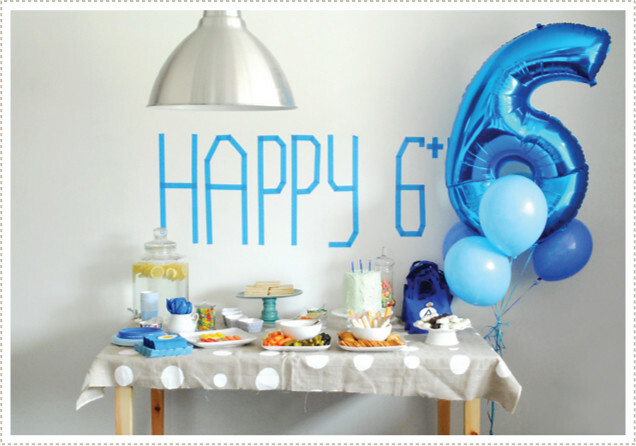 Wishing you all a creative and crafty weekend! *Winner was selected randomly. If there was one more than one comment from the same person, it was considered as one comment total. Friends, I've been dying to share this gem of a book with all of you! 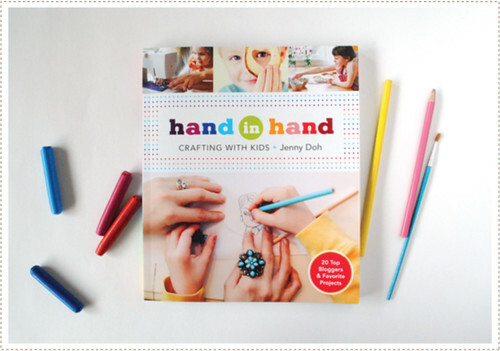 Hand in Hand: Crafting with Kids, by Jenny Doh, hit the shelves on April 3rd and I've been waiting until after all the Easter holiday fun was over to introduce this book you. If you are not already familiar with this new title, you are in a for a treat! 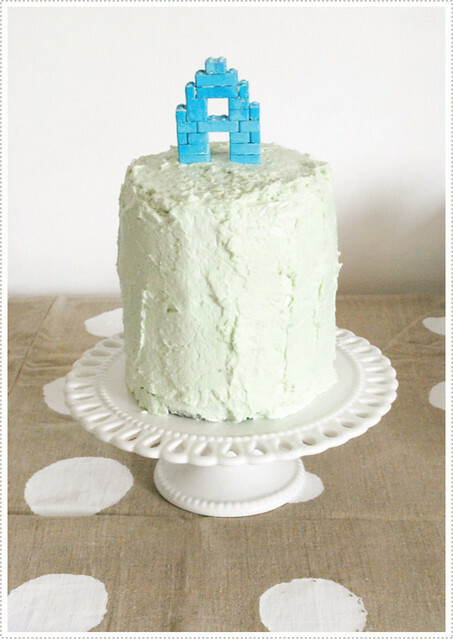 It consists of 20 craft bloggers who focus on creating with kids and share one project each that you can do with your little ones. I feel so honored to have been selected to be amongst this great group and know you will love the book as much as I do. If you follow this blog at all you'll know that I'm just a bit passionate about creating art and crafting with your kids. It has added so much to my life, and to the life of my kids. 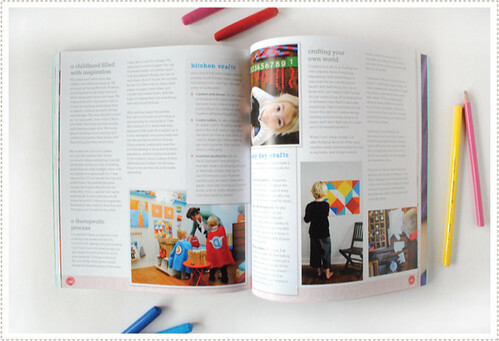 And what a treat it is to read all of the wonderful thoughts and experiences about creating with your kids from the many other bloggers in this book. I really was inspired to work hand in hand :) with my Littles, all over again! I was lucky enough to meat a few of these ladies in person at ALT, such as Dana Willard of MADE and Rachel Faucett of Handmade Charlotte and they are just as inspiring in person as you will find them in this book and on their blogs. Many of these other bloggers have inspired me and my kids in days past and many others have been a treat to discover and explore for the first time. 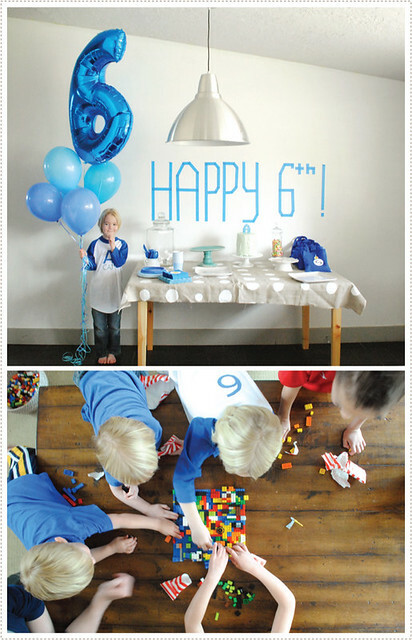 Here are a few spreads from our chapter. 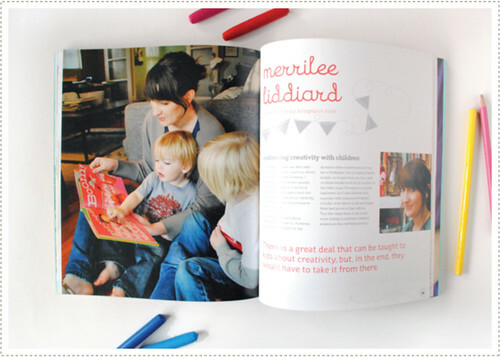 It was so fun to really explore and express how I feel about creativity and cultivating it in the home. There are some fun shots from our South Pasadena home that I miss from time to time. (I especially miss all that space in the kids room!). And there is a shot of how we ended up storing our geometric floor puzzle. (We adhered it to the wall with Velcro which made for some great movable wall art! And then when we wanted to have more free reign and play with it on the floor, we simply removed the tiles from the wall and placed them on the floor in fun and interesting patterns). 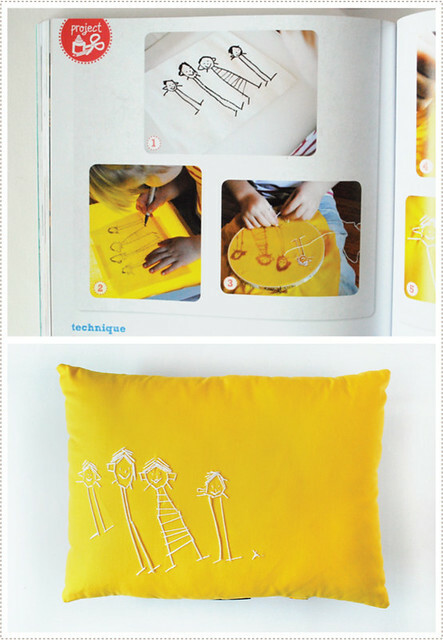 And for our craft contribution, Little A and I show you how you and your kids can make a personalized keepsake pillow from an original drawing, fabric and a bit of embroidery floss. 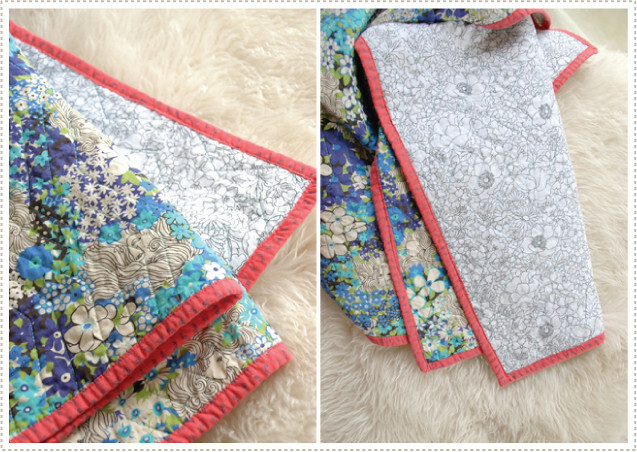 We loved working on this together and still treasure this pillow! If you are interested in perusing the many creative activities found in this book (which of course you are!) just leave a comment and I'll enter you into the drawing for a free book! 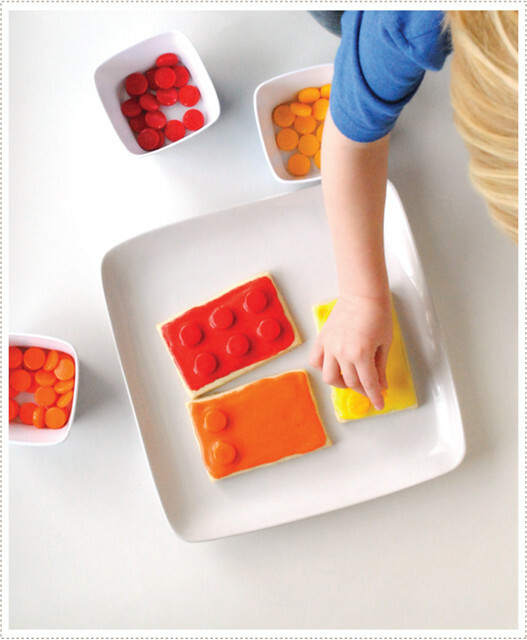 And I'd LOVE to hear something creative (big or small) that you and your little one(s) love to do together. 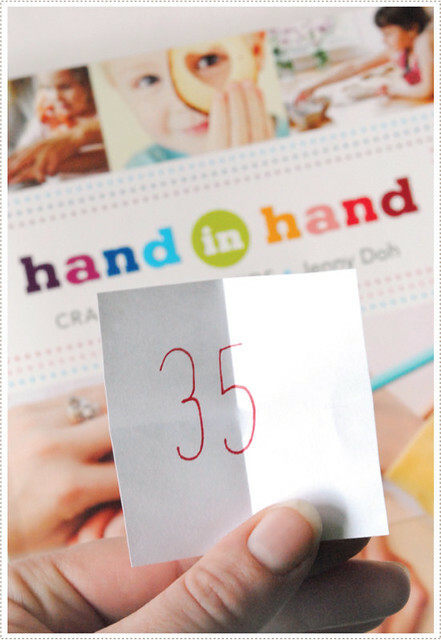 You have until the end of Wed. April 18th to comment and enter the Hand in Hand book giveaway! From there I will randomly select a number from the comments and reveal who has won the book a week from today, Friday, April 20th. I hope all of you had a most lovely holiday weekend. We are stuffed to the gills with delicious chocolates, candies and...well, more chocolate, and more candy! Every year I try to go for less candy and it seems like every year we end up with just a bit more than the year before (I think it's all those extra egg hunts that I wasn't calculating into my candy consumtion ratio). I'm definitely going to have to figure out the formula for the perfect balance one of these years. Well at least I did have a slew of stickers in the mix to help things out a bit. And remember when I mentioned that I had no idea what my Littles would be wearing this year? Well, that was no lie. And I can't deny, that made me a little sad. 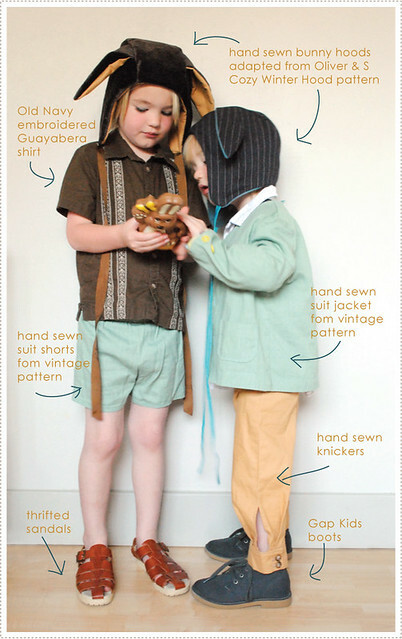 I love to sew for my children and feel like I haven't been able to do so as much as I'd like to as of late. So I was really counting on Easter to sink my teeth into a great project, such as a pair vintage inspired suits or something equally inspiring. Well, I didn't manage to sneak in enough time to sew any suits this year...but I did at least get a little sewing in. 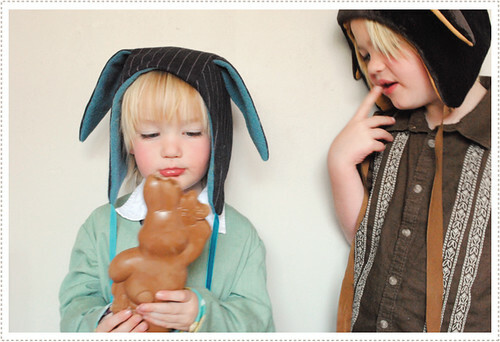 Thanks to Leisel of Oliver & S, I managed to sew two bunny hoods adapted from her Cozy Winter Hood pattern found in her Little Things to Sew book. (And I can't help but give a shout out to two friends involved in the identity of the Oliver & S brand; designer friend, Brooke Reynolds, and illustrator friend Dan Andreasen [he illustrates their paper dolls]. OK and my own little shout out and teeny, tiny, contribution: I helped Brooke find Dan for the job back when I worked in NY as an illustration agent. And he's just so perfect, don't you think?! 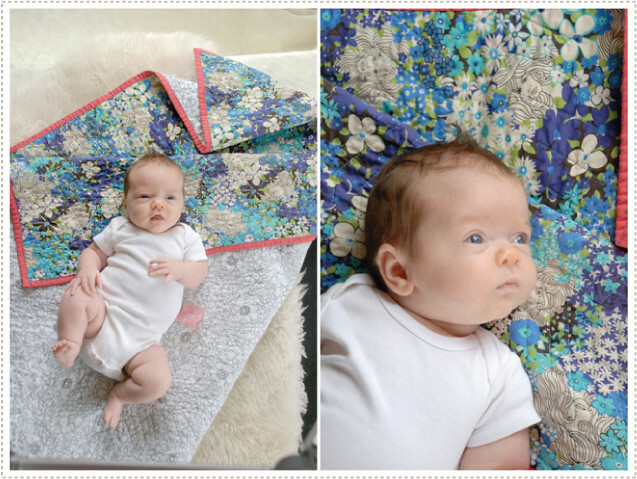 So needless to say, I'm pretty much in love with all things Oliver & S - and that's not even getting into how utterly darling Liesel's patterns are!). So back to the hoods. To make these I used the Cozy Winter Hood pattern from the book and changed up the ears to be two long and floppy bunny ears - to fit the festive occasion of course. 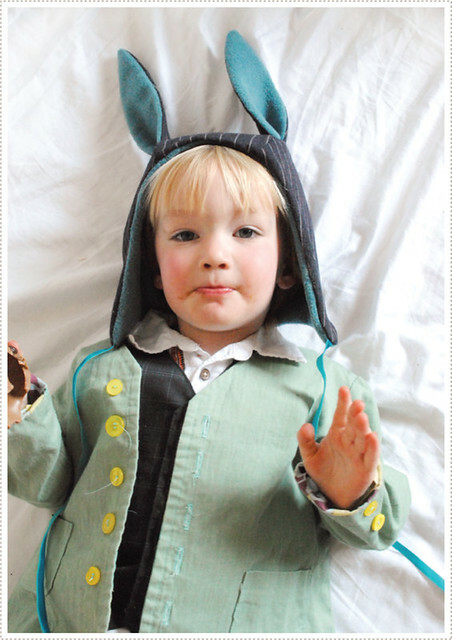 I really wanted use fabric I had on hand so I used some of Jon's old pants and blue fleece for Little O's bunny hood and some brown velvet and leftover tan fabric for Little A's. And once I was finished with these, and placed them on their little heads, I couldn't hold back my motherly squeals of delight. The boys just looked too darn cute. (And something tells me that this is the last year I'm going to get away with such "cute" items of clothing for Little A. In fact, it took him realizing that these looked like their hooded bath towels [something I hadn't even thought of] to help him feel like they were cool enough to wear. That and a Belgium chocolate bunny). 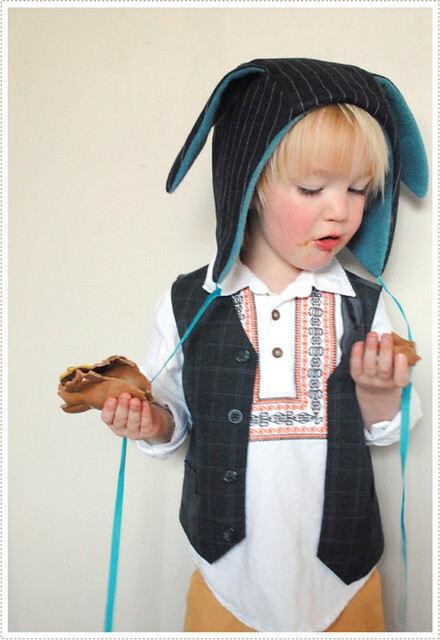 As for the rest of their Easter ensemble, well if you follow my blog at all, you'll quickly see that it ended up being an mix-n-match amalgamation of clothing from the past. And you know what, I really couldn't be more pleased with how it all came together. I might even like how it turned out better than if I had planned the whole look out from the beginning. -"Force yourself to try new things with your wardrobe. Take some items from your own closet that you never thought you'd wear together and try new ways to put together an outfit." -"Mistakes and Lack of Finances often make for the best style ideas!" I believe that this holds true not only for our own closets, but for our little ones as well! So when I was up against a wall this Easter, I went scrounging through my Littles closets to see what sort of magic I could muster up. And if you care to take a look at a few of these posts from the past, you'll see where just about everything came from (OK, and you'll be forced to go down memory lane with me, realizing just how little my Littles once were and wonder with me "where did those chunky cheeks and legs go to anyway?"). 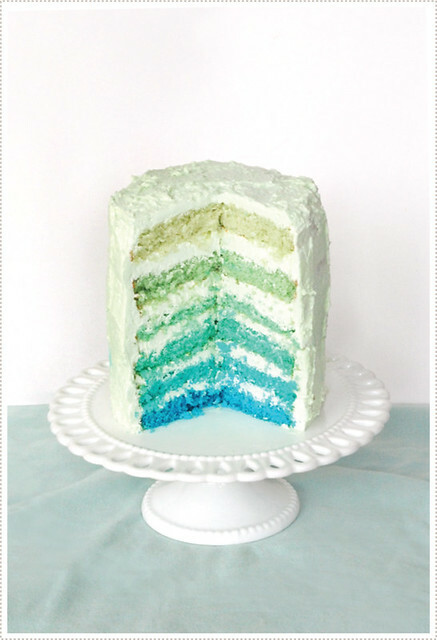 Take a look here: 1, 2, 3, 4. I really love the eclectic, "Mexican wedding shirt, meets little story book French boy, meets a hint of something Scandinavian", look to the final overall ensemble. Again, something I couldn't have planned if I hadn't been forced to get creative. And if you are wanting to do something similar, I think it helps to have slowly built up an arsenal of items that you are fond of and can work with. 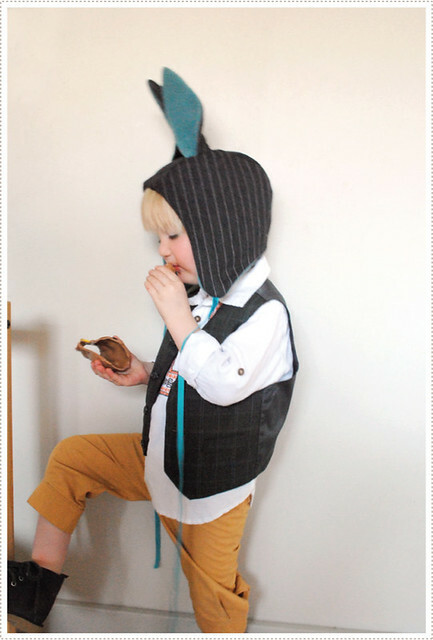 Here are just a few tips I would share with you on how to build up your child's wardrobe so that you can make some mix-n-match magic any time, and for any occasion. Buy just a few unique, statement pieces from some of your favorite kids designers. They don't have to be outrageously expensive (I love to buy from Etsy) but don't be afraid to stretch just a bit on one or two unique shirts, that one-of-a-kind sweater, a stand out colorful skirt or those bright yellow pants that are sure to make any outfit pop. (And I confess, if you know another kid will be wearing it down the road, it makes more sense to buy a few pieces that stand the test of time both in design and quality). 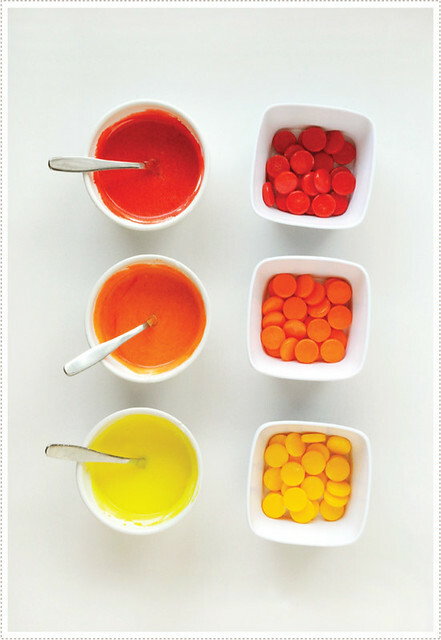 Read more about my thoughts on mixing hi+low here. Don't be afraid to play with sizing. I know that this might sound odd, but I'm telling you, don't feel like you have to stick with what the tag says. I know a number of t-shirts and jackets that look better a bit more snug than the tag suggests. And when you are working with skirts, capris and gauchos, well there is quite a range of sizes you can work with (adjusting the waist to fit of course). Just don't be afraid to try it. You never know what might end up creating the perfect balance. That slightly snug sweater from 2 years ago, slung over that boxy blouse, paired with a tutu and tiara must might be the right ticket. And if you don't like it, well just go back to what you were doing before. No harm done. Just try it and don't over think it. 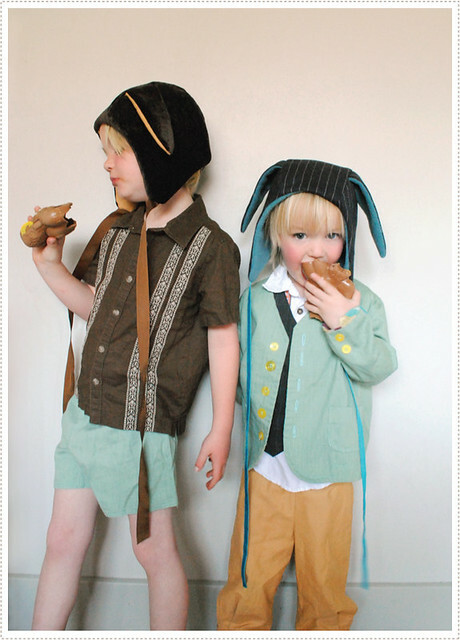 Kids fashion should be fun, easy, unexpected, and a reflection of them! Sometimes it might look silly and others might not appreciate it. Buy hey, they are kids! you can get away with it. And fashion should be fun and just a little unexpected. I once had a friend tell me that "If I didn't feel just a little silly at first when trying something new, then I wasn't approaching fashion right". Well anyway, we had fun. The boys enjoyed seeing their old clothes brought out again and were right there with me in deciding which boy would wear what and found it rather humorous that both of them got to wear elements of the same suit at the same time. And I was pleased with how Little O's look continued to surprise and delight even when deconstructed. I was afraid that this Gap Kids embroidered guayabera shirt would not pair well with the rest of things but ended up loving the element of the unexpected. 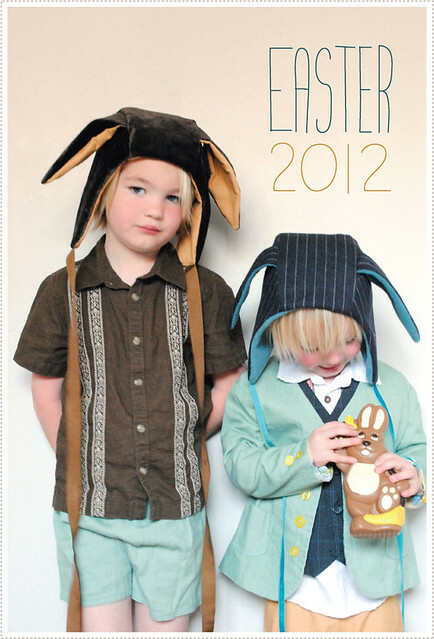 And my two little bunnies? Well if nothing else, in the end they were happy to have devoured an entire chocolate bunny and then happily hop onto other things such shredding apart those much anticipated surprise balls. And me, well I couldn't have been more pleased with how things serendipitously turned out. So what about you? 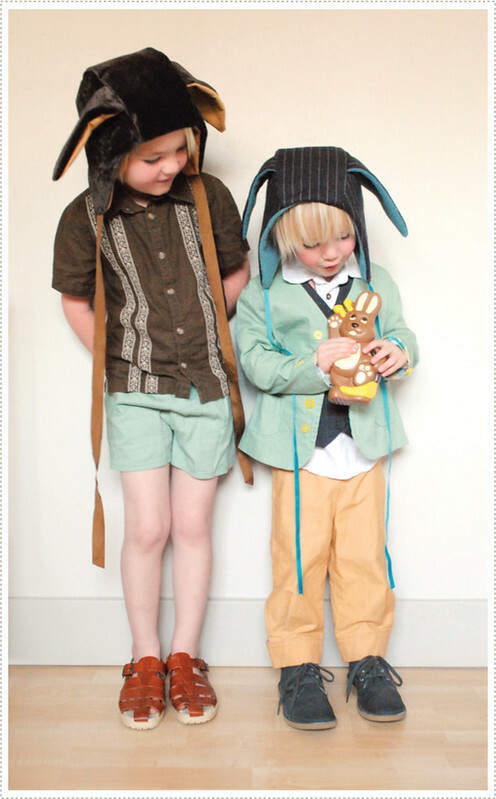 What are some of your favorite staples or tricks to styling your kids wardrobes? Any favorite places to shop? I always love to hear new ideas and great resources! 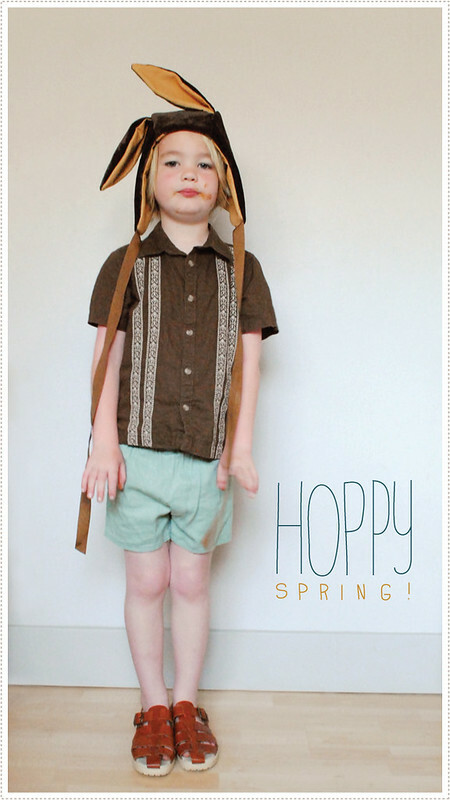 Are you running around crazy realizing that you have yet to purchase Easter candy, egg dye and various other Easter hunt amenities, and have absolutely no idea what your Littles will be wearing on Easter Sunday? If so, you're not alone. I'm right there with you. But I can help...at least just a little bit. 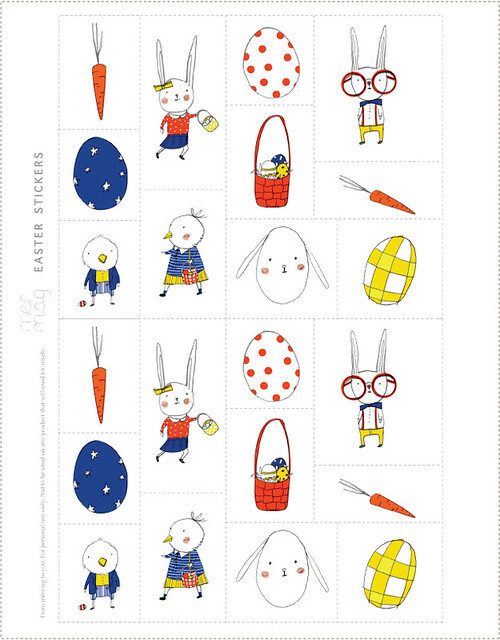 Forget some of that candy and fill up those plastic eggs with some free downloadable Easter stickers that I illustrated. 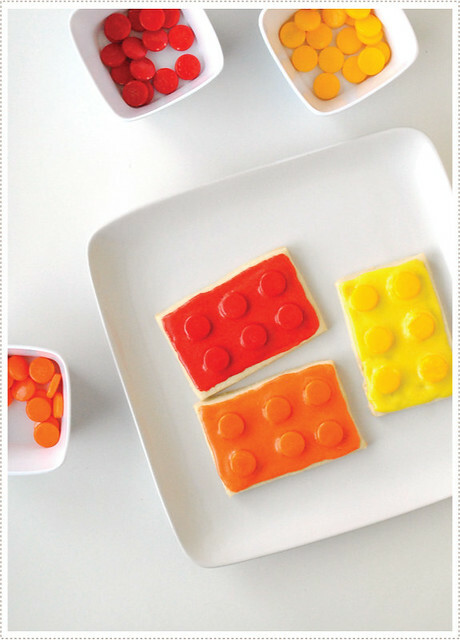 Your kids will love it and you'll enjoy forgoing some of that after-sugar shock. To get started you just download the free printable stickers and print them out on full sheet label paper (found at your local office supply store). 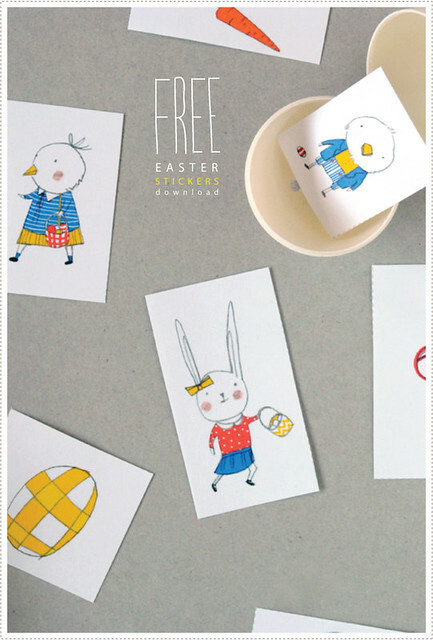 You can then cut them up and place them in plastic eggs or have fun with it and hide them in a crepe paper surprise ball! 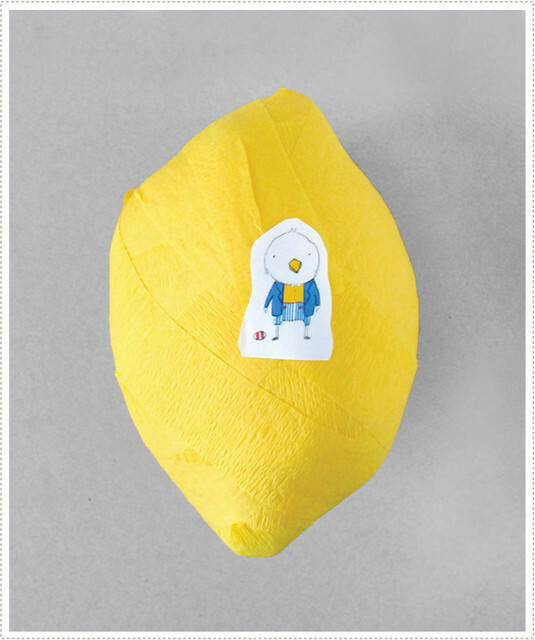 (or surprise "lemon" as mine turned out to be). 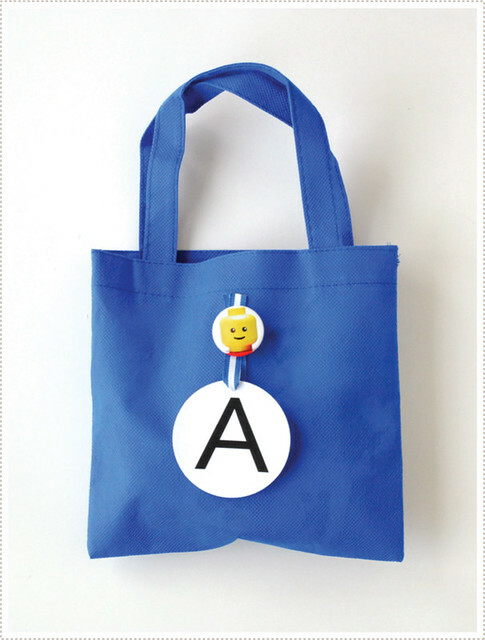 A group of us got together last night to make some of these for our Littles and it was so fun! 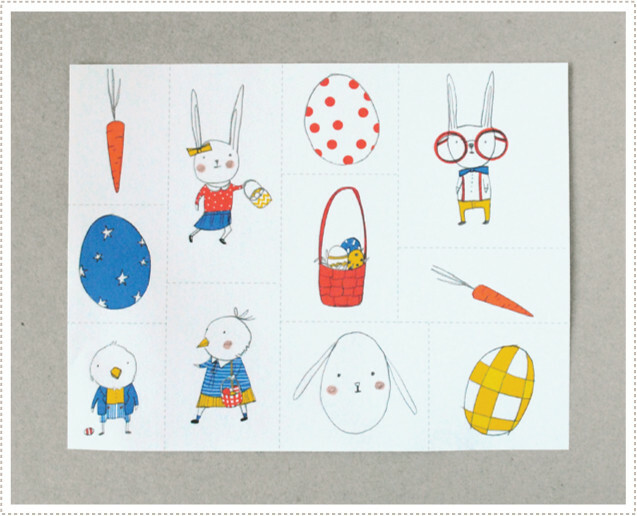 Read more about it here on Sarah Jane's darling blog (and be sure to download her adorable little bunny puppet while you're at it). Surprise balls are so fun and not as much work as I would have originally thought. It's an endeavor I'd highly recommend (especially amongst friends). And as for the stickers, well my Littles have really enjoyed playing with them and have created identities for each character. I just gave them some paper, crayons and the stickers and let them go at it. And for about 15-20 min they were happily self-entertained. I'd say that's a success.